Well, I’ve done it. Prices for my prints are up on my website for all to see. It’s been surprisingly stressful. Not because I have been struggling with computer programming; that’s covered in my ‘programming for puddings’ initiative with my clever brother-in-law Simon (he’s ordered proper old fashioned steamed treacle pudding and custard this visit). No, rather it makes me feel a bit vulnerable somehow to stand up and be counted. I’ve talked about pricing before and how I organise this. So why the angst? I think it’s because we artists are all feeling our way with unique products. I can look at pricing for other people’s prints, but we’re not comparing baked bean cans here. No, we artists have to say that X pounds, dollars or yen are what we are worth and I am as jumpy about undervaluing my work as I am about overvaluing it. All I can say is that I try to be fair: I do like heating in the winter, but I don’t expect it to be turned on by a housemaid. • If you fall in love with a print because you saw it previously in a gallery but later come to me, I will send a little cut back to the gallery as a thank you for the referral. November: Tax return and printing my Christmas card, two things now looming large on my to-do list. Both of them are essentials to my business and I would suggest to most working artists, even if the tax return results in a sympathetic note of encouragement from the tax man and a large rebate. The Christmas card is important to me as an opportunity for a bit of feel good publicity. As a printmaker I am in the perfect position to send out a hand pulled card which shows people exactly what I do and how well I can do it. Fact is that it is a chore. I don’t print editions of sixty for good reason: I find it boring and the more I print, the less faith I have in the image. There’s a tipping point which I almost reach every year where I trash the lot in a flurry of anxiety. Pragmatism prevails and I’m glad as most people seem perfectly delighted with the result and occasionally I stumble on one in an office or up on a friend’s wall and it all seems worthwhile. I have three Christmas lists. Well, three in my head. Reality is one very confused and dirty piece of paper which I dig out every year and curse the fact that I haven’t written it all out nicely with proper addresses like I intended. The lists go: family, friends, and work. Not everyone gets a proper print. The beloved family do (probably thinking ‘not another damn print’), then the appreciative among friends (inducing rivalry as to who gets the highest edition number) and lastly work. I’m ruthless about the last one and I advise anyone planning this PR exercise to do the same. I only send them to current people: galleries where I’m exhibiting or will be exhibiting, suppliers who cut me some slack (quite a few of those, thank you), magazine and newspaper contacts etc. People go off the list, but may come back on again. Point is that I can only print so many and it’s an exclusive treat. The other thing to do is to TELL people just what a treat they are receiving. I only have to look at the print to envisage three carefully aligned layers of colour cut from one lino block printed on decent paper standing at a heavy press. My audience doesn’t, so I tell them. I send the print flat in a card envelope with a nicely printed sheet saying Happy Christmas etc with a paragraph at the bottom explaining exactly how I’ve made the print and why. After several years of this people start to have a collection and, as I hopefully get more important, they look forward to having a new one. They remember me with warm and fuzzy goodwill and that’s got to be a good thing hasn’t it? I use touch all the time. 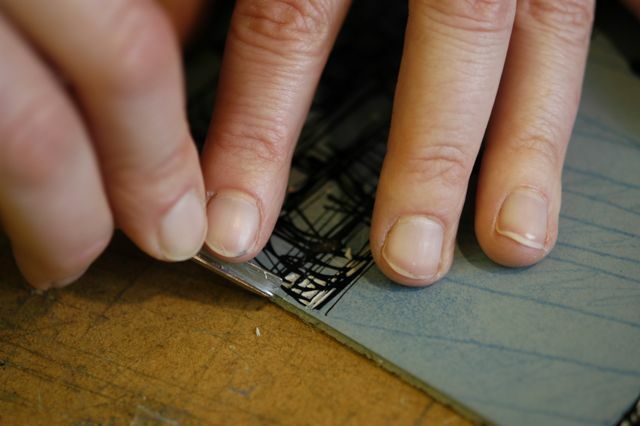 I must use my fingertips at least as much as my eyes when I am cutting my printing blocks. I depend on touch to tell me how to pack my press, the texture of my printing inks and the quality of my paper. It’s a hugely under estimated tool and one I am trying to get my students to rely on at every opportunity. It can be a whole new mine of information and if you don’t use it, you are missing out. I was brought up to touch things. Where other mums would be shouting ‘hands off!’ mine would be telling me the best way to know things was by feel. I must have had clean hands in those days and some guidelines; I certainly never remember being in trouble for touching, but I learnt to do it carefully and with respect. Do please try it, though I don’t advise squishing peaches if the man you are buying them from has a cross face and his eye on you, or teaching your five year old the merits of cashmere after a visit to a chocolate shop. Touch will tell you lots of things about printmaking, but it comes at the price of using your bare hands and not minding too much about details like nails and cuticles. Personally I am proud to have strong (stronger now I am nine sheets of ply into my latest commission) clever hands that tell a story of life lived and I wouldn’t like to be without their feedback.